We all know that our students talk about us. Sometimes it’s good, sometimes bad. Sometimes it’s cruel or unfair, and sometimes it’s right on the mark. Some of their words get back to us, but lots more stay in the locker room, hallways, and Facebook pages. To be honest, we really can’t concern ourselves with everything our students say. Too often immaturity and frustration manifest themselves in horrible and destructive comments that in no way truly reflect us or our teaching. 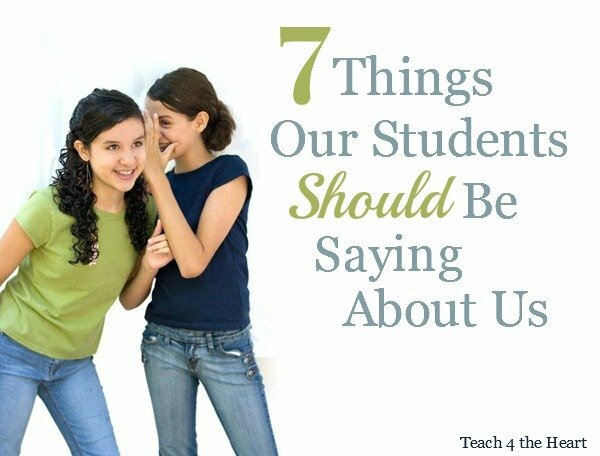 But there are some things we should really be hoping that our students are saying about us. Maybe not everyone, and maybe not all the time. But when a new student finds out they’re having Mr. So-and-so, what is the general consensus? Here’s some things I hope they’re saying about me. S/he’s nice. This may sound super generic, but coming from a student, I take this as a compliment. Our students should view us as kind, friendly, encouraging, and supportive. This doesn’t mean that we don’t discipline, but it means that when we do, we don’t yell at them or demean them. Instead, we speak the truth in love. S/he’s tough. If our students are saying we’re nice, they need to be following it with a caveat. “She’s nice, but tough.” We must have high expectations in our classrooms, both academically and behaviorally. They’ll say we’re tough if we set the bar high, don’t put up with nonsense or laziness, and expect their best in everything. S/he admits mistakes. If our students aren’t saying this about us, then we are going to have problems. We have to admit our mistakes, whether it’s a simple addition error or a lapse of judgment on our part. Are you able to apologize to a student or even to the whole class if necessary? It’s the difference between turning off our students and gaining their respect. S/he makes things easy to understand. No matter how difficult our subject is, we should be making it easy for our students to understand. And this is one time where what the students say is often pretty accurate. If you’re hearing rumors that your lectures are confusing and the students are lost, it’s probably time to rethink something. Great teachers take challenging concepts and make them manageable, and hopefully even simple. If you’re having trouble in this area, find a way to observe great teachers (whether in person or by video online) and ask fellow teachers who excel in this area to observe you and give you ideas for improvement. S/he cares. Regardless of our strengths and weaknesses as teachers, this one aspect can make or break us. When our students know that we care about them, everything else seems less important. When they aren’t so sure, problems quickly arise and multiply. So do your students know you care? Notice I didn’t ask if you care. You probably wouldn’t still be reading this if you didn’t. I asked if they know you care. Do you show them? Are you there for them? Do you help them and support them and discipline them in love? They may not fully appreciate you now, but if you’re showing them you care, they’ll look back and pay you this high compliment. S/he’s real. If we want to go beyond teaching our subject and truly impact our students’ lives and hearts, we just have to be real. Genuine love, genuine faith, genuine passion – these are the things that will open up our students’ hearts and allow us to see real breakthroughs and real change. So don’t put up a front, and don’t be afraid to be honest. Let your students see the real you, and you will see your impact soar. Which of these statements resonates most with you? What would you add to the list? Share your thoughts with a comment below. This was really good, Linda. I miss teaching so much! YES. I love “s/he’s nice” as #1. Kindness works in most cases with kids, as it does with adults. I’m often disheartened by how many teachers get a kick out of being the “mean” teacher. I agree with all seven points but what resounds with me most is #7. Having taught in middle school and high school for the past six years (and elementary in the distant past) I have learned that secondary students will forgive many flaws but their tolerance for someone who is “fake” is absolutely zero. Their ability to detect teachers who aren’t being themselves, who are putting on an act – no matter the reason, is unmatched in nature. Being someone you are not will instantly rob you of credibility in their eyes and winning it back once lost is not easy. God made you who you are and put you in front of the class for a reason… be yourself!